Thought Bali was only a paradise for surfers? Recently, the jungles of the Indonesian island, have been filling up with downhill trails and dirt jumps that are world class. Mountain biking is becoming increasingly popular on the island, and is attracting a whole new niche of action sports athletes. 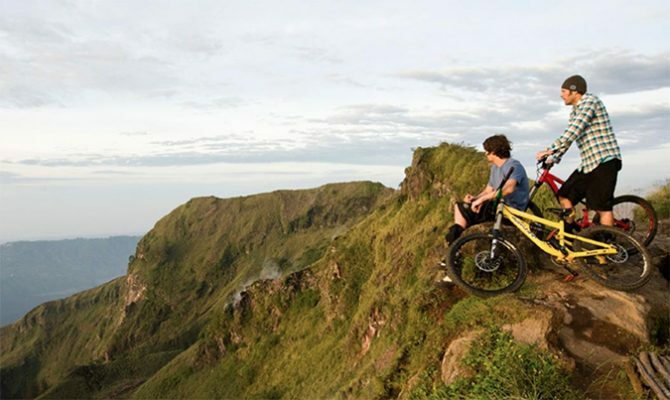 The unique land features and endless jungles that Bali offers are attracting tons of mountain bikers in search of adventurous rides. The sport has been rapidly expanding on the island the last three years. Whether you want to stick with downhill, do some trail rides, or just hit a park with actual man-made jump features, there’s plenty. Much like Bali’s surf opportunities, there’s something for every rider. One might even be tempted to go full-on “Indiana Jones” on the island – biking through the jungle, machete in hand, in search of single-track treasure. Watch this clip of Bali riders like Wyn Masters and Nick Pescetto, tear up trails and hit features at the BBP, along with other riders at Bali’s ‘Chill House’. The BBP is located on the North side of central Bali, but people are riding all over the island. In this clip, they ride a ridge on Mount Batur, an active volcano in east Bali.